I’m sure you’ve all heard about magnetic polishes already. You know, polishes with particles that move when you put them near a magnet. And depending on the magnet, we get different patterns on the nails (star, stripes, waves, …) These types of polishes aren’t new to the market. Lancome released one called Le Magnetique years ago and it was a huge hit. Then the Star Magnet polishes by L’Oreal were released a couple of years ago. And in the past year the magnetic polishes became trendy again. I don’t complain at all since I think these polishes are cool. 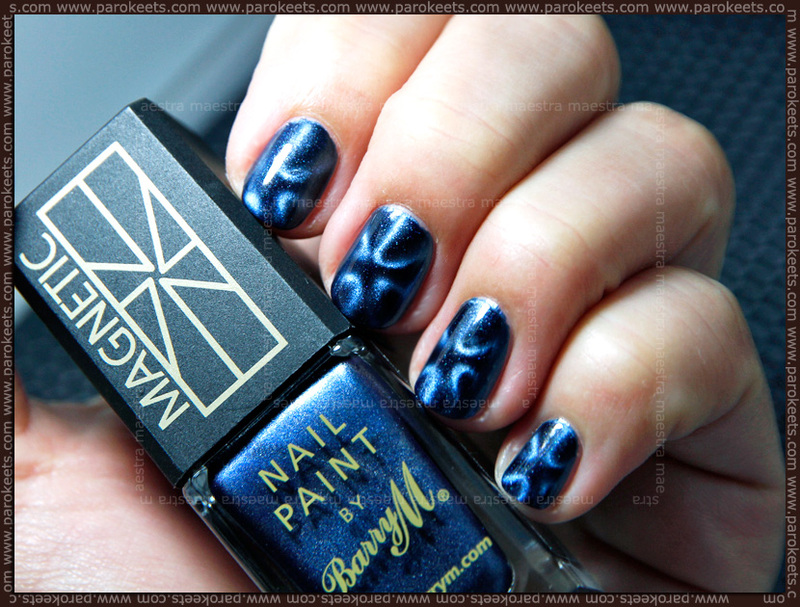 Today I have two magnetic polishes by Barry M to show you. 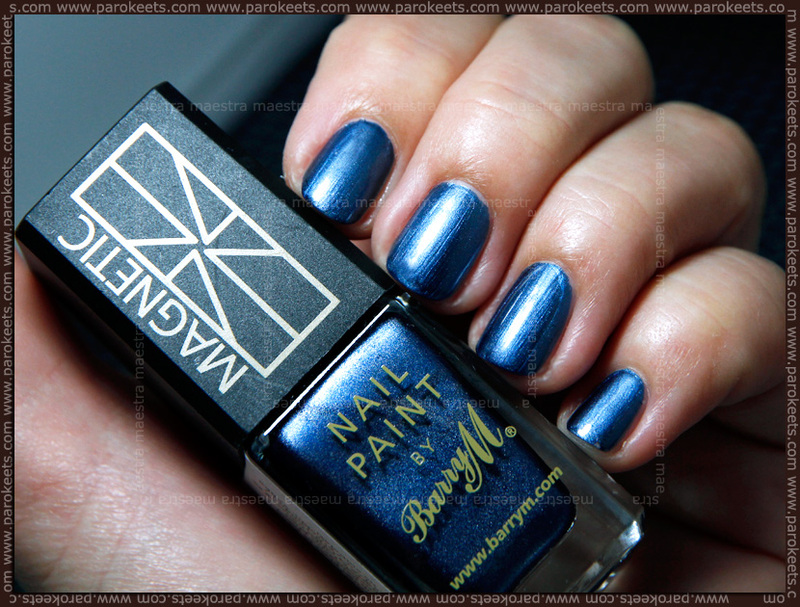 Barry M Nail Paint in Blue with the star magnet. Barry M Nail paint in Violet with the horizontal stripes magnet. Both polishes are very pigmented, they dry pretty fast and are easy to apply (considering that these are metallic polishes). If you have difficulties applying metallic polishes, my advice would be: have enough polish on the brush, make fast strokes, don’t go over one spot more than once. How do I apply magnetic polishes? First I apply the first coat of the (magnetic) polish to all the nails and let them dry for a couple of minutes. Next I apply the second coat of magnetic nail polish to one nail and immediately hold (for 5 – 10 seconds) the magnet as close to the nail as possible. Next I move on to the next nail and repeat the previous procedure. Quick advice: Most of magnetic polishes come with magnets. Some magnets are better than the others (the Barry M magnets are very good). I would just like to remind you that you can use one magnet with all different magnetic polishes (different brands). You can also try your kitchen magnets or other magnets that you find at home. Have you tried magnetic polishes already? Which ones have you tried and which ones are your favorite? *Products were sent to me for review. the star design is super cool!! Čula sam za magnetske lakove ali ih nisam isprobala. Uvijek kad bi kupovala lakove, privukli bi me neki šljokičasti lakovi pa sam na kraju uvijek odustala od magnetskih. Ali sad poslije ovih tvojih slika mislim da me jakooo privlače, efekti na tvojim noktima su predobri! Dopada mi se što je ova zvezda drugačija od uobičajenih koje se dobijaju raznim magnetima koje dobijamo uz magnetne lakove.